Speak again, Cordelia: A little early, but Happy Chinese New Year! Since it is almost Chinese New Year, I decided to dedicate the efforts of my next baking venture towards a Chinese-style dessert. 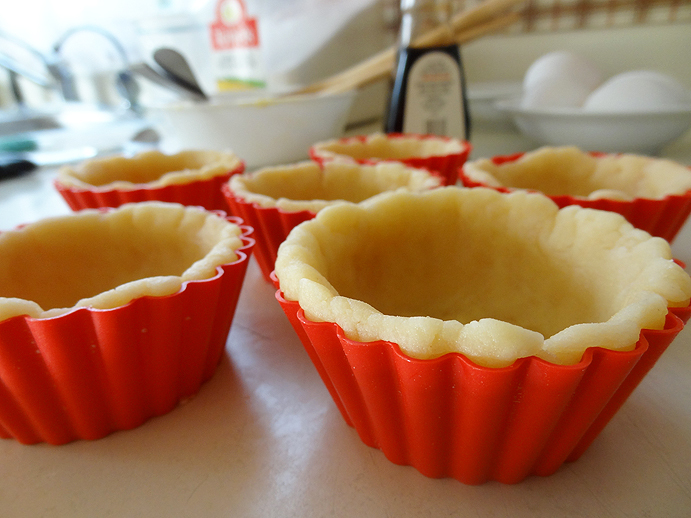 And on a whim, I tried making Hong Kong style egg tarts, or better known as "dan tat" (蛋撻). 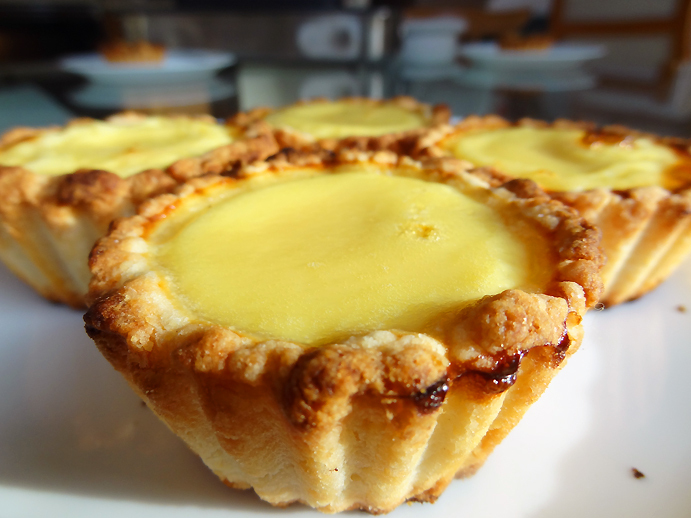 Egg tarts have been a staple in bakeries and coffee shops in Hong Kong since the beginning of time (and as far as I'm concerned, that's sometime before I was born). I tend to shrink away from making Chinese pastries or desserts, probably because I had them so often while growing up, that I would see it as a failure if the ones I made didn't taste exactly like the ones I would find in stores. That, and also the fact that my grandparents are super critical of food, and the products of my baking experiments are not an exception. Certainly my grandparents would tell me if they thought any of my baked goods tasted passable or even good, but it is always followed by a word of constructive criticism, or sometimes they would simply comment with "it is too _____" or "it could be more _____" and leave it up to me to decipher their implications on what they generally thought of it. While I don't mind most of the time--and it is helpful for an aspiring baker such as myself, of course--I also feel that they may be extra critical if I try making something familiar to them (ie. Chinese cuisine) as opposed to making something they would have never tried before, and sometimes I just don't feel up to the task yet. 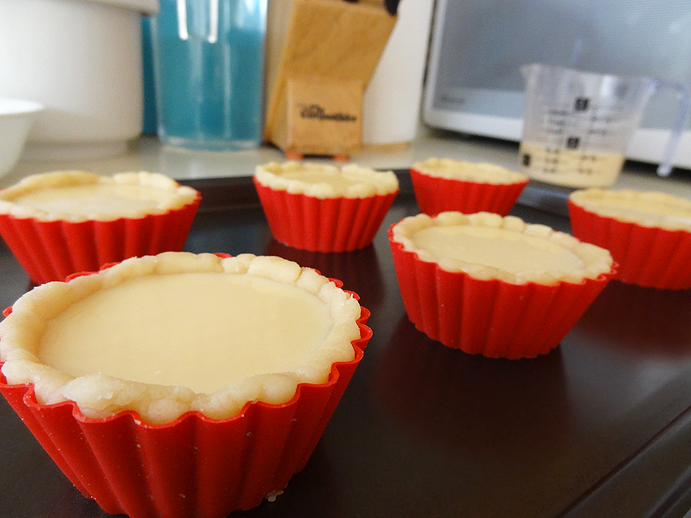 Nevertheless, I decided to try my hand at the egg tarts. Instead of using tin foil cups (I did say I tried this on a whim), I used the silicone cupcake molds I received for my birthday last year. 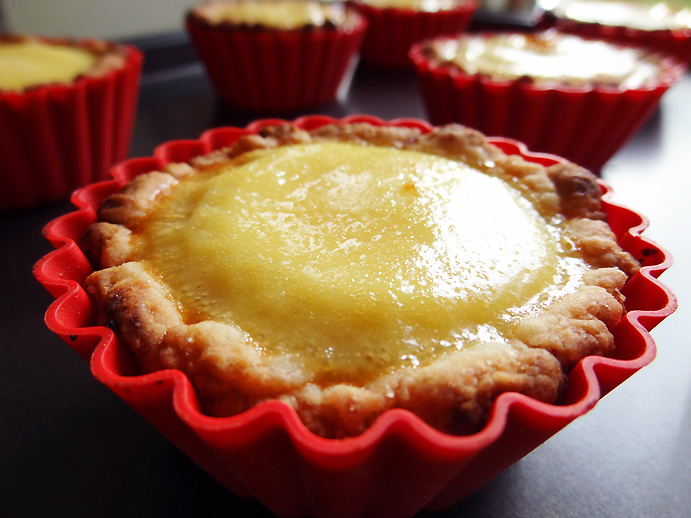 Other than the fact that I seemed to have made the crust a tad too thick, and that the bottoms of some of them were slightly burnt, the egg tarts turned out quite nicely! I might adjust the recipe next time for the benefit of my grandma, who has diabetes, and maybe actually use foil cups. Although I didn't exactly get a stamp of approval from my grandparents this time, perhaps I will attempt more Chinese pastries in the near future. It was actually kind of fun. Here's an early Happy Chinese New Year from me!